Graduate (G) and Undergraduate (UG) students from the AIAA Student Chapter in the Department of Aerospace Engineering at the University of Maryland supported AIAA outreach efforts at the USA Science and Engineering Expo on the National Mall on October 23 and 24, 2010. This outreach activity by students of the AIAA National Capital Section was undertaken to support AIAA?s outreach efforts for K-12 students, as well as the general public. Thousands stopped by the AIAA booth to learn about the physics of flight, especially the forces of lift, drag, weight and thrust. 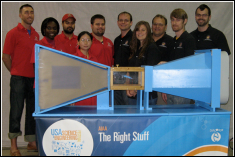 Aerodynamic forces of lift and drag were demonstrated using a small-scale model of an open circuit wind tunnel that was refurbished over the summer of 2010 by a high school intern, Chani Wereley. Students demonstrated trailing edge vortices using threads, stall, and ?drag races? using diecast models of sports cars versus SUVs, where the vehicle with the greatest drag was pushed by the air flow faster and, so, won the race. The festival was accompanied by glorious 75� sunny weather in October, and a great time was had by all!